Media: Soft cover, 80 pages of text and pictures. 11 pages of profiles. Advantages: Polish and English text. 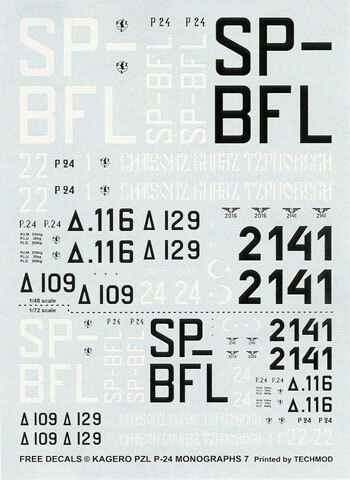 Decals in 1/72 and 1/48 for nine aircraft and masks for clear parts; excellent and extensive pictures and drawings. According to the author, the PZL P.24 was, for a period during the 1930’s, one of the fastest and most heavily armed fighters in the world. But the Polish Air Force never put it into service. It also incorporated the unique gull wing created by Zygmunt Pulawski the main designer for PZL (Panstwowe Zaklady Lotnicze or National Aircraft Works) , and which became know as the “Pulawski Wings” or “Polish Wings”. The monograph begins with the history of the development of the P.24. We discover that the P.24 became heavily armed because the 14 cylinder rotary engine hade no space through which fuselage mounted machine guns could be placed. I presume that since they had to mount the weapons on the wings, they said to themselves; “why not go for the big 20 mm Oerlikon cannon”, which is what they did, although not all models used the cannon. The monograph then describes the use of the PZL P.24 with the air forces of various nations: The P.24 A and C with Turkey; the P.24B with Bulgaria; the P.24E with Rumania and the P. 24F and G with Greece. There are numerous and excellent pictures to illustrate the P.24s in the service of each nation’s air force. The text of the monograph goes on to provide a full technical description of the P.24. It intricately describes the wings, fuselage, control surfaces cockpit, engines and armament. 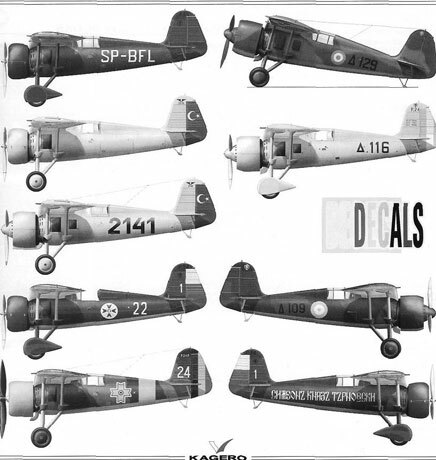 The text concludes with a description of the various paint schemes that were applied to the P.24 by and for each of the countries that used this aircraft. This monograph provides not only an excellent written description of the PZL P.24, but also provides an abundance of excellent pictures, diagrams and drawings showing nearly every aspect of this aircraft. Each model of the P.24 is described, such that you can quickly discern the differences between an E and an F or a B and a C. There is even a page showing the variety of letters, numbers and logos applied by the various users. The profiles are numerous and well done. Finally Kagero provides the icing on the cake in the form of a set of decals, printed by TECHMOD, and masks. The decals are in both 1/72 and 1/48 scale. Presumably the masks are to be used on the Mirage 1/48 P.24 kits. There are marking for nine aircraft, but there are no national symbols. These would be included in the model kit or obtained elsewhere. For each of the aircraft on the sheet, there is a full color profile. The English text is a full translation of the Polish, and is in parallel columns. The translation appears well done with only minor lapses. 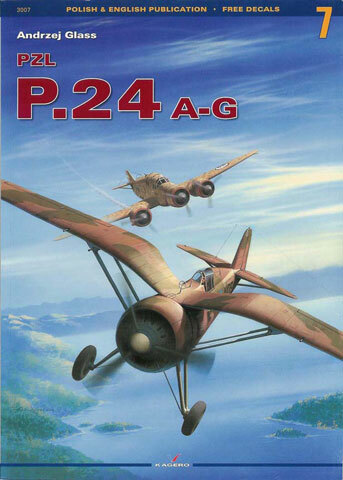 If you are going to build the Mirage PZL P.24s or have any interest in the less well known aircraft of WW-2, then this is a great volume to get.